Showing results for tags 'IndyGo'. INDIANAPOLIS – More than a dozen articulated buses will begin hitting Indianapolis streets on Monday. The 60-foot-long IndyGo buses are 20 feet longer than the service’s traditional vehicles. The articulated buses hold more people and bend in the middle, making it easier to navigate city streets. The 17 articulated buses are nothing new to Indianapolis—the city had such transports in the mid-80s, but they were retired in the 90s. The units are refurbished, and can accommodate 40 percent more passengers. 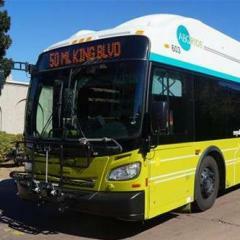 IndyGo will introduce the buses on Route 39 and Route 8—its busiest routes. Read more: http://fox59.com/201.../#ixzz2kg8kJack -- Anyone know where these refurbished artics came from?